Spencer G. Bennet directs this 1960s Western starring Dan Duryea. 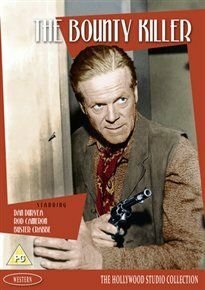 After arriving in the lawless town of Silver Creek, Willie Duggan (Duryea) quickly realises that justice can only be achieved with a gun and becomes a bounty hunter alongside Captain Luther (Fuzzy Knight). They take down a number of criminals but find their lives in danger when they come up against the ruthless Mike Clayman (Buster Crabbe).